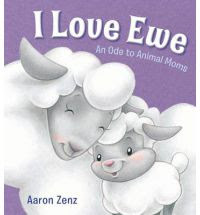 New books from Aaron Zenz and would I like to read them?! Does May follow April? Should chocolate be considered a main course? Yes! Of course! And so his new titles landed on my door-step. Hug a Bull: An Ode to Animal Dads was the first book we picked up to read. It would be important to note that each of these books teach the proper names for male and female animals. The "voice" on each page is the baby animal addressing its father. If you don't read it from the perspective of the baby animal, it can come off sort of insulting to actual human fathers. Take a look, my dad's a Gander. Take a nap, our dads are Boars. Each page spread is filled with various animals from bulls to boars, as you've likely gathered. The same goes for the book on animal mothers. I opened up I Love Ewe: An Ode to Animal Moms and read "my mom's a cow." This was followed by a very long pause while I regrouped and applied the information to the animals alone. (Heh. Note: I wouldn't gift this book to a new mother or anything because it could come off a bit questionably.) But if you want to learn the names of female adult animals then this is a really fantastic book. This book is much like its counterpart for fathers. Baby animals are addressing their mommies and letting us know what they call them. Of course, after we've looked at the daddies and the mommies we're going to take a look at the babies. 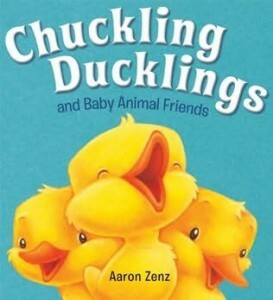 Chuckling Ducklings and Baby Animal Friends covers the gamut of baby animals from ducklings to foals to puggles. (Don't know what that is? Look it up. It's not just a crossbred dog.) All of the books above are told in rhyme. As Zenz has small children of his own, he's aware this method of story telling and information dumping has appeal. 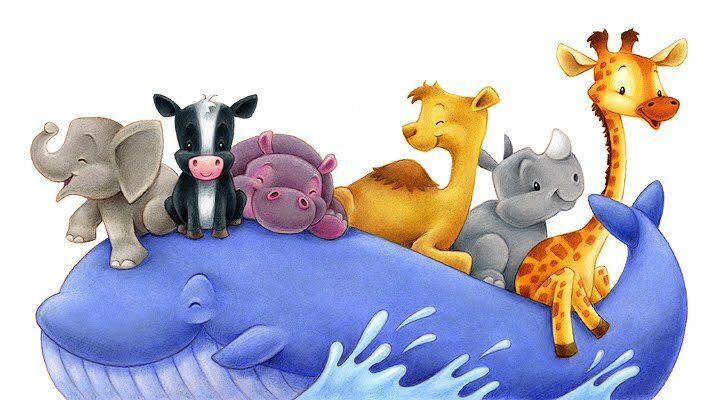 He also knows that his illustrations must have appeal in order to read the book and who could deny but that his animals are incredibly cute!? Almost makes me want to cuddle a whale. Almost. 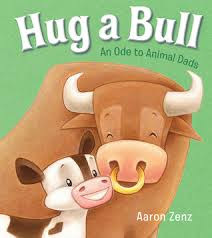 We've been a fan of Zenz around these parts for awhile now, thanks to his book The HICCUPotamas (linked to my review). Also, he blogs with his children (who are illustrators in their own right!) over at Bookie Wookie. It's one of the most fun and creative blogs involving kids I've ever seen and ever expect to see! Do hop on over and see what the Zenz family is up to! Thanks to Aaron Zenz for making a few copies of the above titles for our family to check out, in exchange for our honest thoughts! Wow, these look cute. I love the clever link between things like "look" and "gander." Wow, I sure am behind in visiting my bloggy friends!! Yes, I agree his animals are incredibly cute! Great review!